When you have no work to do and want to relax yourself at your leisure time, what will you wear? In this post, we would like to show you a collection of some casual-chic outfits for this summer. They are all what you can find in your wardrobe, such as the sun-tops, denim shorts and jeans. In addition, accessories are necessary if you want your look more fashionable. The gallery below sets a good example for all women as for how to make an effortless street style outfit look. Just stay here and scroll down. Check them out and get yourself inspired. Enjoy! The floral shorts add fun to the dark top and the white sneakers make this outfit wonderful for the outdoor time. Plus, hat and sunglasses are what you should not miss during the scorching summer days. For a prettier look, just try a cute top with pleated hemlines. And the floral shorts and floral accessories are essential for such a sweet look. This outfit is wonderful wherever you go. 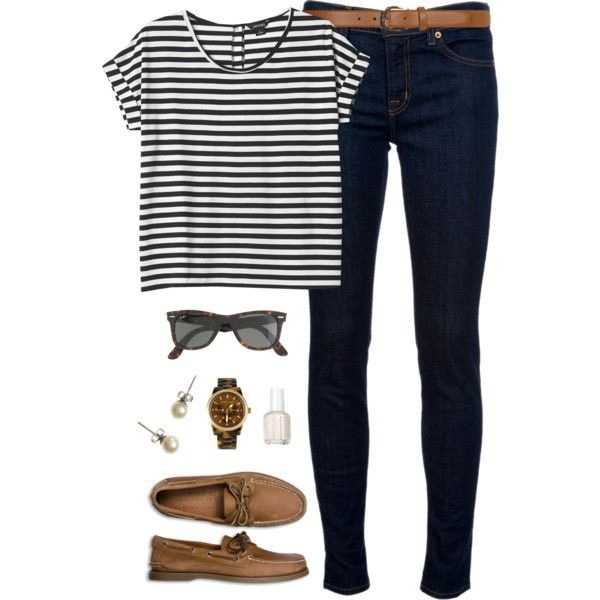 You will like this outfit idea if you always prefer the simple fashion style. Furthermore, a comely natural makeup will make you look more fabulous and the overall look will be refreshed by a pair of clear green gemstone earrings. Colorful floral shorts and bright fuchsia earrings glam up the simple top. Accessories are not necessary, but they can really make you much more fashionable! Black shorts are simple to get matched and you can pick up a pretty pink tank top to make your summer look lovely. This outfit is comfortable to wear and it’s great for women at any age. Denim shorts are always chic from season to season. If you wear a printed top and then add some beautiful accessories, then you will look effortless fabulous. Sometimes, a simple monochromatic top with a chic metallic necklace will look fabulous with the basic denim shorts. Besides, a pair of floral flats will add more sweetness to your look. Chiffon texture is the best choice for summer. It’s also the most ideal piece for romantic ladies. A dark chiffon top with bright red shorts are just chic for a wonderful holiday look. Take out your shorts and flip-flops in the same color. Then pick up some accessories in the similar shades and combine them together. Thus, you will get a stylish look without any efforts. Peal is still great for summer! Candy colors are popular for summer! 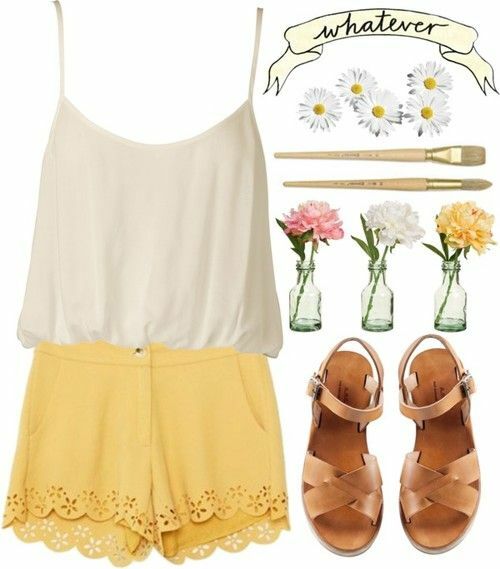 You can pair your yellow shorts with a simple white top, which will give you an adorable girl-next-door. 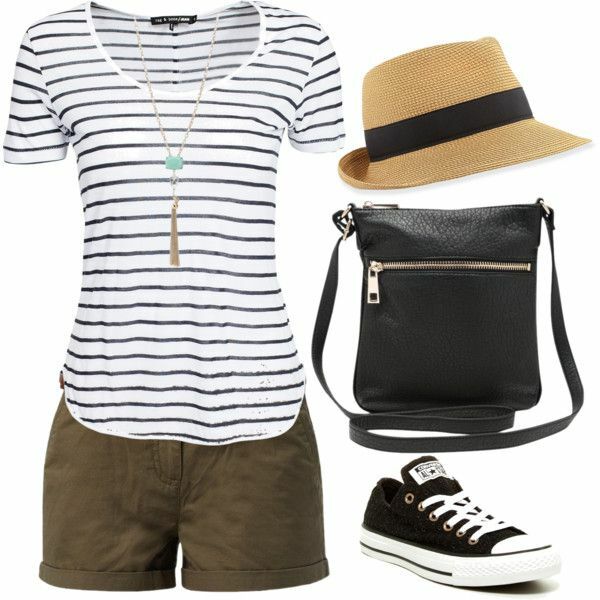 This summer outfit with striped top and red shorts are so chic for younger women to copy. The white jeans are beautiful with any tops. And the coral rose rings look even prettier with the coral cloth. The wavy printed top is chic with the brown flat sandals. 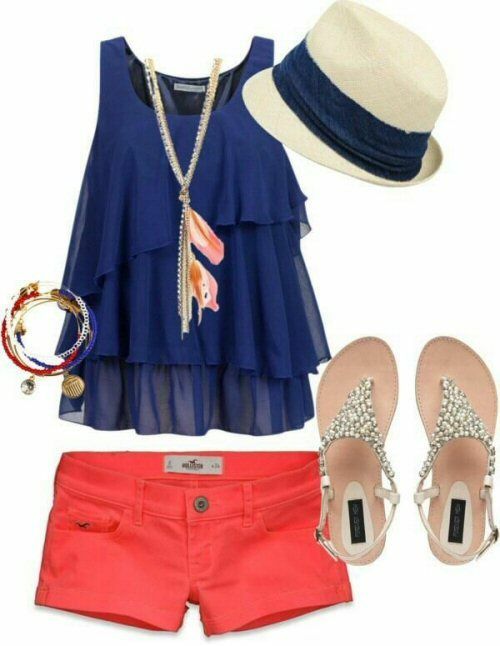 And the denim shorts are fantastic enough to complete this look.